Who in his right mind wants this jihad ape back in Australia? A Turkish court has rejected a request from the Australian government for the extradition of Islamic State recruiter and jihadist Neil Prakash. His lawyer says the ruling could see him released if the court decides he isn’t being investigated for other crimes. Prakash has been linked to the failed Melbourne plot to behead a police officer and another attack that saw two officers stabbed outside a Melbourne police station. Can you believe it? 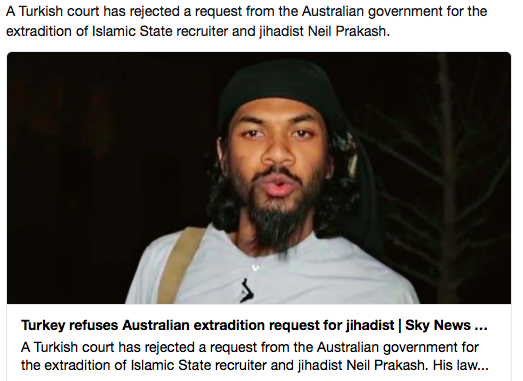 Malcolm Turnbull and Julie Bishop want Australia’s most notorious terrorist, the ISIS recruiter Neil Prakash, extradited back here. Why, for God’s sake, when an Australian court would bend over backwards to set him free; and even if he’s locked up, it would be at Australian taxpayers’ expense? Please, let him stay in Turkey where he’s likely to face the (rather less merciful) Islamic justice that he wanted to bring to Australia. The last thing we need is to import terrorists, even those we exported in the first place. Over the past few years, about 200 Australians left the country to fight with terrorists in the Middle East. About the same number were actively supporting them from here. Our agencies think about 100 were killed, but that still leaves about 100 who are likely to want to return here — not because they have any respect for us but because our system of welfare, fairness and political correctness invariably puts the interests of a few ahead of the rights of the many. It was to keep these people out that the former prime minister first proposed stripping citizenship from dual citizens who were terrorists and started to consider measures like temporary exclusion orders for terrorists who only had Australian citizenship, like Prakash, who was born in Melbourne. The Turnbull government needs to start thinking about how you keep terrorists out — even if they are Australian citizens — not how you bring them back. That’s because sadly, even when we’re trying to be tough, we’re still too soft. Last week, for instance, a Melbourne judge banned the fully-veiled wife of a charged terrorist from his courtroom. Good on him. But then a special room was made available for her to watch the proceedings that she fails to respect. I don’t pretend it’s easy for a tolerant society to deal with totally intolerant people but we have to find answers because these problems are not going away. Look at the cost to Australian taxpayers! Turnbull and Bishop only want this piece of vile camel crap back in Australia so they can be seen to be big on the world stage and play to the conservative side of the electorate. No doubt he will be out of the Turkish jail with the full blessing of the Islamic Turkish government killing and recruiting before Malcolm and Julie get their respective acts together. Neil Prakash is a one shot, one kill moment if ever I saw one. Only wish there was someone who could do it and put an end to this piece of sewer garbage before he ends up costing the Australian taxpayer millions in legal cost and the 5 star accommodation at some swanky Australian penal institution.